January 31, 2019 1 comment on "How to Clean a Rubber Bath Mat"
Can You Wash Bath Mat in Washing Machine? I am pretty good about keeping our bathrooms clean, but one of the things that I always neglect is the rubber bath mat in the bottom of the bathtub. Honestly, if I would just pick up the bath mat and hang it up after my kids take a bath, it wouldn’t start to grow mold and mildew, right!? Right. Well, needless to say our bath mat needs to be cleaned again. In the past I have turned the bath mat upside down in the bathtub and let it soak in some bleach water. I then scrubbed it really good with a scrub brush. This bleach and scrubbing method does work effectively, but I wondered what would happen if I just put it in the washing machine?? Well I recently gave this a try, and it came out wonderfully clean! Throw your rubber bath mat in the washing machine with a couple of bath towels, and then add your normal laundry detergent. After the bath mat is done being washed, just hang it up to air dry. No scrubbing, no mess, and a very clean bath mat. When you remove your rubber bath mat from the bathtub to wash it, you may notice that your bath mat has left behind stains in your bathtub. These stains are likely excess mold and/or mildew. Remove these bath tub stains by making a mixture of 1 cup white vinegar and 2 cups hot water. 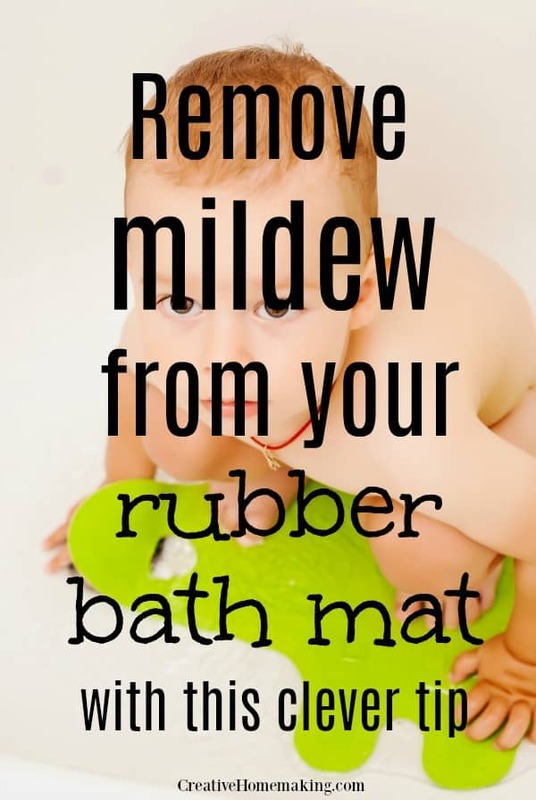 Mix it in a spray bottle and apply to the bath mat stain. Let the vinegar mixture soak into the stain for a bit then scrub with a stiff cleaning brush. 1 Comment on "How to Clean a Rubber Bath Mat"
Great tips! I will definitely try them when I clean my bathroom, I never manage to fully clean the bath mat as good as I want to.